Filk music is a musical culture, genre, and community tied to science fiction/fantasy/horror fandom and a type of fan labor. The genre has been active since the early 1950s, and played primarily since the mid-1970s. "A filk of ___" refers to a filksong based on another song, using the same tune and often, but not necessarily, similar structure of plot and/or lyrics. It may be a parody of the original (not necessarily humorous), with content referring back to it, or it may be a contrafactum which reuses the music and possibly the lyrical structure of the original, but with different words. Full appreciation of a parody requires familiarity with the original, but appreciation of a contrafactum may not. (intransitive) To participate in filk singing, not necessarily as a planned or organized event, as in "The party guests filked." (transitive) To write a filk music parody of an existing song, humorous or otherwise, as in "I filked 'Hope Eyrie'." When used in this way, "filk" does not imply that all song parodies are considered filk music, nor does it imply that all filk songs are parodies. Setting satirical or parody lyrics to established tunes is not exclusively the province of science fiction fandom: works of parody music such as those found in MAD Magazine or performed by Weird Al Yankovic have their own long-established traditions and history. As Interfilk's "What is it?" page demonstrates, there is no consensus on the definition of filk. Attempts have been made to define filk based on various criteria. Filk has been defined as folk music, usually with a science fiction or fantasy theme, but this definition is not exact. Filkers have been known to write filk songs about a variety of topics, including but not limited to tangentially related topics such as computers and cats. In addition, while the majority of filk songs are in the folk style, other styles such as blues, calypso, and even rock appear from time to time. Filk has been defined as what is sung or performed by the network of people who originally gathered to sing at science fiction/fantasy conventions. This definition might be summarized as, "We can argue what it is until we're red or green or blue, but when filkers get together it's the thing we do." Yet another definition focuses on filking as a community of those who are interested in filk music and who form part of the social network self-identified with filking. As described later in this article, the origins of filk in science fiction conventions and its current organization emphasizes the social-network aspect of filking. The social aspect of filk as contrasted with the "performer vs. audience" dichotomy of much of modern music was described in a speech by ethnomusicologist Dr. Sally Childs-Helton. By any of these definitions, filk is a form of music created from within science fiction and fantasy fandom, often performed late at night at science fiction conventions, though there are now dedicated filk conventions in Canada, England, Germany, and the USA. The boundaries of filking are vague. For example, filking overlaps with the singing and music performed by participants in the Society for Creative Anachronism or at LARPs. In keeping with the folk-culture roots of filk, the musical styles and topics of filk music are eclectic. While a plurality of filk is rooted firmly in acoustic-instrument folk music, other pieces and artists draw inspiration from rock, a cappella vocal groups, or other styles. 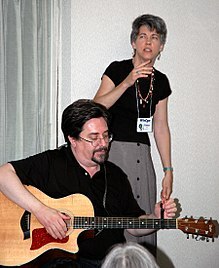 The hobbyist and itinerant nature of filk events (especially filk circles) gives some advantages to acoustic-vocal soloists and small groups, who need only carry a lightweight instrument or two and whose rehearsals do not need to balance scheduling logistics against regular work and other obligations. One of the few rock-style groups in filk has been Ookla the Mok, whose studio recordings use techniques common in modern rock. Some styles of filk rely heavily on sampling the original source material and integrating it into electronica and hip-hop music such as 76's Objects in Space (an homage to the popular TV show Firefly, which itself featured several filk songs) and DJ Qbert's Wave Twisters. The range of topics in filk songs stems from its cultural roots in fandom. Many songs honor specific works in science fiction, fantasy, or speculative fiction. Other songs are about science, fantasy, computers, technology in general, or values related to technological change. Yet others are about the culture of fandom, including filk itself (both as a phenomenon within fandom, and as a sub-culture). Many filk songs (such as Leslie Fish's "Carmen Miranda's Ghost Is Haunting Space Station 3") are humorous while others treat their subjects seriously (like Steve Macdonald's "Journey's Done"). However, some common themes do not fall neatly into filk's science fiction origins. Such topics include songs about cats, popular culture, and politics. These are perhaps best explained as an outgrowth of filk as a folk culture, open in some respects to expansion by individual artists. A significant number of filk songs are parodies, whether in the original sense of simply re-using a tune or in the modern sense of specifically humorous re-use. Some are parodies of songs from popular culture, others are parodies of existing filk songs. Although parody is not the primary focus of the filk music culture, the proportion of parody songs found in filk is higher than in other musical cultures. One subtype of filk songs is the "ose" song, one on themes of death and gloom. The term derives from the word "morose", as in "ose, morose, even-more-ose". A further variant is "cheeri-ose": ose songs to cheery tunes, or treating such a subject lightheartedly; cf. Tom Lehrer's (non-filk) "Irish Ballad". For the first few decades of the occasional science fiction convention, there had been late-night singing sessions in hotel rooms. Part of this practice may have been rooted in an older folk culture of fans. Some of the oldest filks coming out of fandom were protest songs with original words and music written by a group of New York fans called The Futurians, and were written by Fred Pohl and Cyril Kornbluth (see Damon Knight's book of the same name, which contains the words and music to several of them). With the break up of the city clubs common during the Great Depression, filking moved to science fiction conventions, often in the form of late-night singing sessions in hotel rooms, lobbies, service passages, or wherever else the filkers could find enough room to play/sing music uninterrupted. In the early 1950s, the term filk music started as a misspelling of folk music in an essay by Lee Jacobs, "The Influence of Science Fiction on Modern American Filk Music". Wrai Ballard, then editor of the Spectator Amateur Press Society refused to publish it for fear that the article's bawdy content could get them into trouble with the Post Office under the Comstock Laws, but found the typo itself amusing, and mentioned it repeatedly; thus, Jacobs' typo became the self-identified term for the genre/subculture while it was still an informal, unrecognized activity at conventions. Its first documented deliberate use was by Karen Anderson in Die Zeitschrift für vollständigen Unsinn (The Journal for Utter Nonsense) #774 (June 1953), for a song written by her husband Poul Anderson. The 1950s also saw the first formal publication of filksongs, generally as lyric sheets, but occasionally complete with (often original) music. While many of those original songs faded into obscurity, some remained popular for decades. By the late 1970s, periodicals such as Kantele and Philk Fee-Nom-Ee-Non offered a ready outlet for filk writers. At the 1974 World Science Fiction Convention author Bob Asprin announced publicly the creation of a group of volunteers he dubbed the Dorsai Irregulars, and a singing session ensued later that night. In the 1970s and 1980s, filking slowly became established as an acknowledged activity at science fiction conventions. Some convention organizers allotted hotel function space late at night for filkers, or filking occurred in hallways, bars or any other place that the filkers could find. Some convention organizers in the 1980s began inviting guests specifically for their filking. Some specialized conventions focused entirely on filk, beginning with FilkCon in Chicago in 1979, organized by Margaret Middleton and Curt Clemmer, later joined by BayFilk in Northern California; the Ohio Valley Filk Fest (OVFF) in Columbus, Ohio; ConChord in Los Angeles and in San Diego, California; Musicon in Nashville, Tennessee; FilKONtario near Toronto, Ontario; a rotating British filkcon, and one (NEFilk) in the northeastern US; the German FilkCONtinental; and others. These efforts grew to include raising funds for traveling filkers. The first was a British Filk Fund. Then, in the early 1990s, several active organizers in North America created Interfilk, which is now the most active traveling filker fund. Beginning with British filker Mike Whitaker in 1992, 40 filkers were the beneficiaries of Interfilk subsidies in its first decade. OVFF began presenting the Pegasus Award annually for excellence in filk in 1984, and FilkOntario started the Filk Hall of Fame in 1995, honoring contributions to the community as well as to the music. After years of amateur tape recordings made at filksings, a trickle of studio-produced albums and tapes began to arrive in the 1970s. These included Folk Songs for Folk Who Ain't Been Yet, featuring Leslie Fish and friends, and Children of the Future by Karen Willson. Off Centaur Publications was one of the first formal attempts to regularly produce and promote filk albums, followed by many others since. As the costs of amateur album production dropped in the 1990s, more filkers created albums and, more recently, audio files available for downloading online. E-mail and the internet have also fostered the networking of self-identified filkers. In the late 1980s, California filker Kay Shapero created the filk group on the Fidonet hobbyist network of electronic bulletin boards. The later creation of other electronic forums — the Usenet group, a United Kingdom e-mail list FILK_UK and the German language list, an IRC channel devoted to filking, and a growing cluster of filkers blogging on LiveJournal (including a LiveJournal community), to pick a few examples — have mirrored the growing connections among other self-identified social networks (or subcultures). The availability of several hundred albums labeled filk, the proliferation of specialty filk conventions, and the continued growth of electronic means for community connections have led to an intensification of community building. A few years into the 21st century, filking as an identifiable community exists on at least three continents. On the album Precious Friend, Pete Seeger and Arlo Guthrie perform "Old Time Religion", in a filk version. Most of the verses of this version were by Gordon Dickson; when Seeger finally discovered this, after the album was issued, he sent royalties on to Dickson. Filk music is most commonly performed in a gathering known as a Filk Circle. Similar to the Drum Circles and Bardic Circles found at SCA events and other fannish events, filk circles can be formed in any location where filkers gather. Filk circles are different from concert-style musical performances. Although filk music can also be performed in front of an audience, and there are concerts scheduled at filk conventions and science fiction conventions worldwide, filk circles are a more common occurrence. The purpose of a filk circle is for musicians to share songs with other musicians, so performing and listening are given equal emphasis. In a filk circle, there is no stage, there is no audience. Those who participate in a filk circle may choose to perform, to listen, or both. Performers may know only one song, or may know an extensive library of songs. Participants are usually encouraged to join in and sing along or play along on their instruments. Filk circles can be formalized parts of larger events, such as being assigned a specific time and location on the schedule of a science fiction convention, or they can be completely informal and spontaneous, forming organically in hotel hallways and lobbies. Filk-specific conventions will usually have multiple filk circles happening simultaneously in different rooms, with some circles focused on a single style or topic. Local parties called housefilks are day-long events in which a single filk circle performs in the host's home. A Filk circle at a science fiction convention. As the name implies, a rough circle of chairs is usually formed. The details depend on the available space and furniture, and it may not even end up being circular, or even have chairs at all. The purpose of the circular formation is both symbolic and functional: By having everyone face each other, it honors all participants as equals, it emphasizes both listening and performing, and it makes each participant visible to every other participant. A formally organized filk circle can have the chairs set up ahead of time, with the organizers estimating the number of participants and adjusting the size of the circle as best they can. A circle that is too large for the number of participants tends to feel uncomfortably empty, but a circle that is too small must enlarge as the number of participants grows. The disruption that results from attempting to enlarge a filk circle in progress can break up the flow of the songs and change the mood, so enlarging the circle is often avoided in favor of adding extra layers (concentric circles) outside the inner circle, space permitting. Traditionally, filk circles are started in the evening and tend to continue very late into the night. Of course, this depends upon the location, the participants, and the organizers. Filk circles have been known to continue all night, or at least into the early morning hours. Those organizing formal filk circles at conventions usually make arrangements with the hotel to have space available for the entire night. There are many exceptions to this; it's not uncommon to find a housefilk scheduled to start in the early afternoon and end in the early evening, for example, to allow participants to get home to sleep. At most filk circles, the participants are expected to bring their own musical instruments (if they play an instrument at all), although sometimes you will find organizers or performers bringing a collection of extra instruments so that others may borrow or experiment with them. Most performers who bring instruments such as guitars are usually happy to loan their instruments to someone who comes to the circle without one. A wide range of instruments can be found in a filk circle, although the most common is the acoustic guitar. Acoustic instruments are more common than electric instruments, although portable keyboards and even theremins are not unheard of. Small, easily portable instruments are more common than large ones, although larger items such as small drum kits and upright basses can be found at some filk circles. A large filk circle might play host to an array of folk and Celtic instruments such as fiddles, mandolins, dulcimers, banjos, flutes, recorders, bodhráns, bongos and darbukas. Songs are presented very informally. They can be given with spoken introductions and explanations, or they can be simply played and allowed to speak for themselves. Songs can be chosen to fit the current mood or theme, or they may be chosen to deliberately change the mood. Songs can be performed by individuals, duos, groups, or groups hastily assembled from other participants. Songs can be accompanied by instruments or be performed a cappella. Songs can be original songs, covers, parodies, instrumentals, or even spoken-word pieces such as poetry and stories. An active and well-attended filk circle, at its peak, will usually be a somewhat continuous stream of songs, with only a small amount of conversation between songs. Filk circles that are just getting started or winding down may have more talking and socializing than music. Filk circles are often given an organizational structure to make it easier for participants to know when it's time to perform or time to listen to other performers. There are many ways to accomplish this, but the most common types of filk circle are listed below. In a bardic circle, each person in the circle (as well as those sitting in concentric circles around the inner circle, if any) goes in turn, with each turn moving sequentially either clockwise or counterclockwise around the circle. Each participant is given the choice of pick, pass, or play. "Pick" means they can request a specific song, a specific performer, a general topic or style, or any other similar request from an individual or from the circle in general. "Pass" means they skip their turn and the choice passes on to the next person in sequence. "Play" means they can perform any song they choose, either specific to the current topic or mood, or deliberately different from the current topic or mood. The advantage of the bardic circle is that it has a clear structure, which enforces politeness. It ensures everyone in the circle gets their turn, so that even shy people can have a chance to request or perform. There are disadvantages, however. A bardic circle with large numbers of participants will take a long time to traverse the entire circle, making people wait too long for their turn. Such a circle was lamented in a filk by Suzette Haden Elgin: "I've been here with my song at the ready since day before yesterday night." There is less spontaneity in a bardic circle than a chaos circle, and the chance of being able to play a good "follower" song is reduced. In a chaos circle, there is no sequential organization. Any performer can simply begin playing a song after the prior song is finished, or any participant can shout out a request. Care must be taken to prevent two songs from starting at the same time. Frequently the word "follower!" is shouted in a chaos circle, meaning that a performer believes they have the perfect song to follow the prior song, and they want to play it now. The chaos circle's advantage is its spontaneity and energy. "Runs" of songs will frequently get started, with each new song intended to make some sort of connection to or commentary on the prior song's topic. The disadvantage is that it takes concentration and effort to be polite and respectful in a chaos circle: It's easy to accidentally interrupt another performer who's trying to start up a song of their own, especially in a very large circle where one might not be able to easily hear the other performer on the opposite side of the room. Chaos circles thus have a reputation of favoring bold, loud performers who can command attention. One countermeasure to such conflicts is for someone, generally not one of the current/starting-up performers, to shout "Filker up! ", possibly pointing to the one being interrupted. This alerts the room, and specifically the (usually unintentional) interrupter, to be quiet and pay attention to the filker who has started performing. A token bardic circle, also known as a "poker-chip" bardic circle, attempts to combine the enforced politeness of the bardic circle with the freeform nature of the chaos circle. A container full of some type of token such as poker chips is supplied for the circle. Each person participating in the circle is given a fixed number of tokens when they enter the room (frequently two tokens), and can throw a token into the center of the circle at any time to claim a pick or play turn (see Bardic, above). When all the active tokens in the circle are used up, they are scooped up and redistributed for the next round. The advantage of a token bardic is that there's still a chance for spontaneity and followers, yet it's easy to be polite to other performers because you can easily see when another performer wants a turn. The disadvantage is that, like bardic, in a large circle it may take a long time for you to get another turn after you've used up your existing turns. There are variations of these styles, some of the variants involving a person acting as a moderator. A given circle can change its style mid-stream, if the participants agree. It's common to see the participants of a bardic circle "go chaos" or vice versa, for example. The etiquette of the filk circle begins with a respect for all music, including (and perhaps especially) amateur music and amateur performers. Everyone is encouraged to perform, regardless of their skill level. No one is criticized except to occasionally give tips or suggestions. 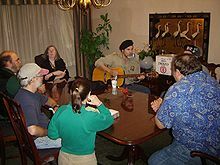 Although singing along and playing along with instruments (including improvisation) is usually encouraged, filk circles are not like jam sessions. Jam sessions are usually focused on extended instrumental improvisation with everyone performing simultaneously, whereas filk circles tend to be more focused on a single performer or group singing an individual song during their turn. Singing along and playing along are expected to be done politely, contributing to the song rather than overshadowing the song's performer. The exception to this rule is when a jam session is specifically scheduled at a filk convention. Disruptions and distractions are discouraged during a song. This includes walking through the circle, general noise, and conversations. If between-song conversations and noise get out of hand, it's common to hear someone shout "Filker up!" as a signal to end the conversations so that the next person can have their turn. There are several shared values that come from the cultural creation of filk in a social network, even one that spans several continents. At a deep level, the folk culture of filk validates creative arts in the midst of an explicitly technological culture. When accepting induction into the Filk Hall of Fame in 2003, ethnomusicologist Sally Childs-Helton said, We have taken our right to be creative and to literally "play" in the best sense of that word. Filk combines folk roots, live music circles, and dominant acoustical instrumentation, on the one hand, with high-tech cultural maintenance, on the other hand—a dense network of filkers' web pages, recordings, sound reinforcement at filk conventions, e-mail lists, and so on. The eclectic content of filk frequently contains that assertion of human creativity, especially in connection with technology. (See for example Leslie Fish's Hope Eyrie.) While there are significant numbers of memorial songs, pessimistic songs blame carelessness, incompetence, and corruption, only rarely considering the frailties of a society built on technology or hopes for the future. Because these themes cross international boundaries in filk, they are not explainable as a purely American optimism vis-a-vis technology (in contrast to Nye, 1996). Within the community, the folk culture of filk acknowledges the legitimacy of music created by artists with a broad range of skills. Those who actively identify themselves as filkers include professional musicians, musical novices, and all ranges in between. The repeat appearances of professional musicians at filk-specific conventions suggests a certain amount of respect given high levels of musical skill within filking, even while the culture is open to less experienced musicians. Whether the occasion is a housefilk in someone's home or a convention (festival) over a weekend, filk culture encourages respectful listening regardless of the performers' skill level and manifest opportunities for participation from single songs in a musical circle to scheduled concerts. That openness to participation is a marked norm in filking, which makes it unusual in a larger society that glorifies competition and super-stardom in performance arts. Mentorship within the filk community includes formal workshops at conventions as well as the informal swapping of advice in various forums. Occasional discussions over the boundaries of filk indicates the extent to which participants in filking are both aware of and keenly interested in the definition of filk as a community. Newsgroup debates over such topics as whether 'Weird Al' Yankovic is a filker suggest the deep feelings involved. In practice, most formal recognition of filkers in various awards are to those who regularly attend self-identified filk events, not to professional artists whose work may be considered found filk. The Pegasus Awards were founded to recognize and honor excellence in filking. These awards are given annually at the Ohio Valley Filk Fest (or OVFF). Anyone with an interest in filk can nominate songs or individuals for the awards, and anyone can vote. It is not necessary to be a member of the convention to be involved in the nomination and voting process. Currently awards are given in six categories: Best Song, Best Performer, Best Writer/Composer, Best Classic Song and two topical categories that vary from year to year. Some examples of past categories include: Best Love Song, Best Literature Song, Best Techie Song, Best Sing Along, etc. The OVFF convention committee solicits nominations for Finalists for the Pegasus Awards (the Nominating Ballot) during the late spring and summer. There is an opinion poll that runs during the year as well to help interested folk brainstorm ideas for the Nominating Ballot. The Finalist Ballot is distributed in the early fall, and must be returned by the opening night of OVFF. Voting can be done online—either to nominate Finalists, or to vote for the Finalists themselves. The final round of voting happens at OVFF itself, where handwritten ballots are collected after the annual Pegasus concert. The entire process is administered by the OVFF convention committee. The Filk Hall of Fame was created by David Hayman in 1995 as a complement to the Pegasus Awards. While the Pegasus Awards acknowledge writing and performing, and therefore often reflect who or what is currently popular, the Hall of Fame was intentionally designed to acknowledge long-term or lasting contributions, including those largely behind the scenes. Anyone may make a nomination. A nomination consists of a description of what the nominee has contributed to filk music and the filk community. Nominations are reviewed annually by a jury consisting of the convention committee of FilKONtario (with the exception of David Hayman, who serves as administrator) and a representative from the committees of each of that year's other filk conventions. The jury members vote independently by secret ballot, and thereby select that year's inductees. Typically, three people are inducted each year, at the banquet at FilKONtario. A small editorial committee combines and edits the text of the nomination(s) to produce a citation, which is read aloud at the banquet, presented to the inductee along with a plaque, and posted on the Hall of Fame web site. ^ "Filk Music: What is it?" Archived 31 December 2005 at the Wayback Machine. Last revised: September 23, 2013. Accessed September 16, 2016. ^ "Filk Hall of Fame: This Is My Tribe". Archived from the original on 16 April 2011. ^ Jardin, Xeni (1 September 2005). "Filk Music for Nerd People". Wired. ^ a b c d Bragg, Roy (18 July 2010). "Filk: Sci-fi meets folk music". San Antonio Express-News. Retrieved 20 July 2010. ^ Rogow, Roberta (1991). Futurespeak: A Fan's Guide to the Language of Science Fiction. New York: Paragon House. p. 238. ISBN 978-1557783479. ^ Gold, Lee. "Tracking Down The First Deliberate Use Of "Filk Song"". Archived from the original on 6 December 2012. Retrieved 25 November 2006. ^ John Hall. "Filk Music and the Dorsai Irregulars". Retrieved 25 November 2006. ^ "ConChord History Pages". Retrieved 23 September 2016. ^ "The Northeast Filk Convention". ^ Sutton, Brenda (2011). "Guest of Honor : Dr. Mary Crowell". Conflikt: A Pacific NorthWest Filk Convention. Retrieved 18 November 2014. We watched this beautiful young woman lug her keyboard (not the most portable of filk instruments, mind you) into the filk room with a slight amount of dread and a large measure of anticipation. And then she played her opening measures -- all Gershwiny, bluesy, and fine -- we all relaxed. ^ a b Gold, Lee (2004). "Welcome to the Filk Circle" (PDF). MASSFILC: The Filk Music Club of New England. Retrieved 18 November 2014. ^ Tank, Fredric L. Rice, The Skeptic. "Lyrics and Tune Copyright 1983 Suzette Haden Elgin Song at the Ready The Filksing was crow". www.skeptictank.org. ^ "Concert & Circle Etiquette" (PDF). Conflikt Rules & Policies. Conflikt Filk Convention. 2016. p. 1. Retrieved 14 May 2017. ^ a b Nye, David E. (1994). American Technological Sublime. Cambridge, Massachusetts: MIT Press. ISBN 0-262-64034-1. OCLC 36213568. ^ a b Jenkins, Henry (1992). "'Strangers No More We Sing': Filk Music, Folk Culture, and the Fan Community". Textual Poachers: Television Fans and Participatory Culture. New York: Routledge. ISBN 0-415-90571-0. OCLC 26055104. ^ Childs-Helton, Barry; Sally Childs-Helton (29 March 2003). "Acceptance Speeches of Barry & Sally Childs-Helton". Filk Hall of Fame. Archived from the original on 23 October 2007. Retrieved 29 November 2007. ^ "Filk Hall of Fame". ^ Judith Hayman; Dave Hayman (March 2001). "The Filk Hall of Fame: A Short History". Filk Hall of Fame. Archived from the original on 28 October 2014. Retrieved 18 November 2014. ^ "Filk Hall of Fame: Nomination Information". Archived from the original on 20 June 2012. Boros, Chris (9 January 2010). "Science-Fiction Music: Monsters, Aliens in 'Filk'". All Things Considered. NPR. Retrieved 10 January 2010. Cohen, Georgiana (20 March 2008). "What is Filk?". The Boston Phoenix. Archived from the original on 6 September 2008. Retrieved 9 August 2017. Look up filk in Wiktionary, the free dictionary. Wikimedia Commons has media related to Filk.